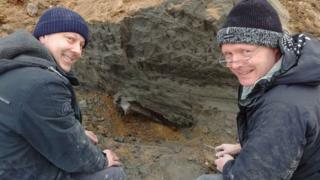 The remains of a giant deer dating back about 10,000 years have been found by walkers on the the Isle of Man. The near-complete skeleton, thought to have had an antler span of more than 2m (6.5ft), was discovered on the Kirk Michael shoreline. It was exposed after part of a cliff face was weakened by winds and heavy rain and collapsed on to the beach. The animal is believed to have been about the same size as other examples previously found on the island. In 1897 the remains of a deer with an antler span of 2.6m (8.5ft) were discovered in St Johns and remain on display at the Manx Museum. Another, which was found in 1819 in Ballaugh, is at the Museum of Scotland in Edinburgh. The latest partially-fossilised discovery was reported to Manx National Heritage (MNH) before an excavation quickly began, amid concerns it may have been washed away by the tide. MNH natural history curator Laura McCoy said: "We were also conscious that a find like this might quickly attract souvenir hunters." Archaeologist Andy Johnson said: "It's the first time I've seen such a complete set of remains in the ground. "Normally you wouldn't expect bone to survive for this long, but it has been preserved because this particular geological deposit is rich in calcium". Manx National Heritage said "over the coming months the remains will be cleaned in readiness for further study and analysis".